Welcome back to our SEO blog series. In this series, we’re discussing why SEO needs to be on your top priority list for this year’s marketing budget. In the first article, we explained the greater WHY behind needing to pay attention to SEO in 2019. If you want a full refresher, click here, to read the article. Now that you have the context, we’re on date #2 with SEO and it’s time to get serious. In this article, we’ll share with you how BNL Media consulting’s relationship with SEO has grown from puppy love to forever and always in sickness and in health. For the rest of our business lives. To paint a picture, BNL Media Consulting knew that SEO was an important aspect of the business when we took a step back and realized that words were more than just words on an Instagram account or blog post. Words evolve and have a lasting effect on people. They always are used to bring someone in and keep them coming back for more. We’ve taken our experience growing BNL’s SEO and created an SEO toolkit that is ready to be offered to our clients. Just as on a date, it’s two people coming together, we’ve learned that SEO and social media marketing have come together to create an unbreakable bond. You can’t have one without the other. So, let’s marry the two. There are many ways to utilize SEO in your business. Here are the top four ways we can help you increase your ranking and land you on the top Google pages! When someone types in a search engine, they are typing in the key words to try and find the right answer for them. Take finding a sustainable straw company for example (since loving the earth is important in 2019). 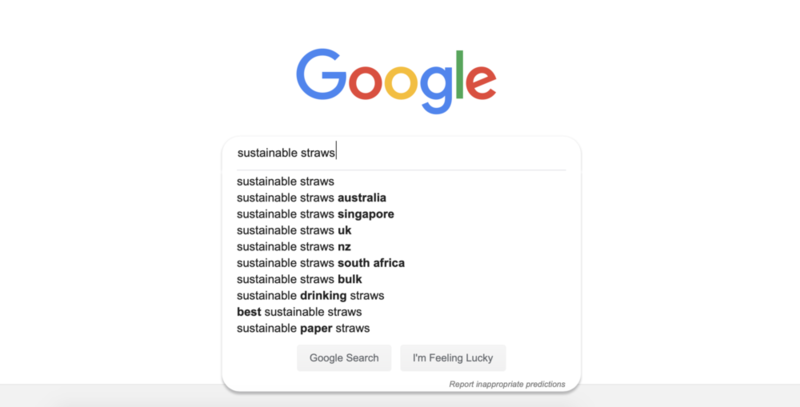 They could type in “sustainable straws” and the companies that are utilizing that keyword phrase would show up on the SERP. It will also show you other phrases people are typing, which is extremely helpful when picking keywords. Below, you’ll see people are searching “best sustainable straws” and “sustainable paper straws”. BNL Media Consulting uses a tool that allows us to search for relevant keywords and keyword phrases for different niches. This tool shows us how many monthly searches a specific keyword is searched, giving us an idea which keywords to use. Keywords should be added throughout a website on every page where there is content. This will help the specific pages rank in a search engine. On top of that, we use targeted keywords for organic blog posts, social media and paid ads. Once we have an idea of the keywords and phrases that people are searching to get to your business or your competition’s website, we can use them when creating paid ads. These paid ads are a great way to show up in a search and fast track your ranking. 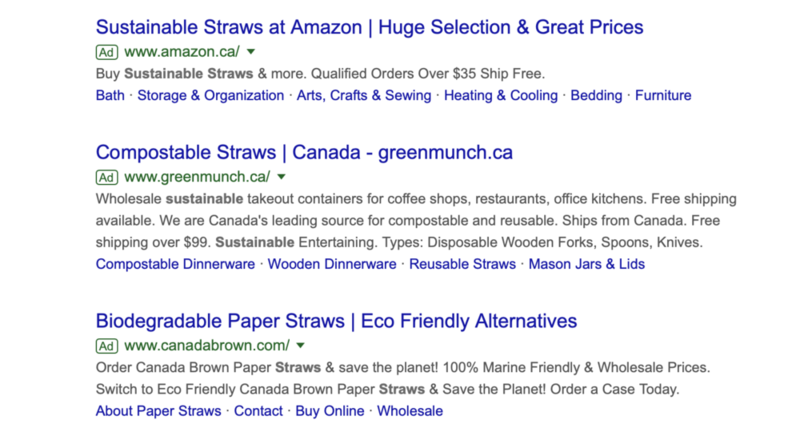 Using the straw example, we could create a Google ad that shows up on the first page of Google when someone searches “Sustainable Straw Company Vancouver”, “Sustainable Straw Company Canada”, “Canadian Made Reusable Straws” etc. An ad shows up on Google with a small square around the word “ad”. A company is charged a certain price every time someone clicks on their ads and visits their website. Prices vary depending on how competitive the chosen keyword is. At BNL Media Consulting, we like to stick to long-tail keywords. We find that the more in-depth someone is when they’re searching, the more likely they’re going to buy and are further down in the buyer’s journey. We want to get you those high-quality leads and help turn them into customers. A very easy way to increase your SEO ranking, is by updating all file names on your website to include relevant keywords. Search engines like Google crawl sites to find out what type of content is written on the pages. They do this by using “spiders”. When a spider crawls your website, the use of keywords is extremely important. In addition to file names, when you post an image on a website, in the backend, there is a place to add “alt-text”. Alt text is the text that shows up if an image isn’t loading. All images should also include keyword alt-text. Like we mentioned above, keywords are your ride-or-die piece of digital marketing today. Does your company’s website have a News or Blog section? If it doesn’t, one needs to be added! The use of blog posts in digital marketing helps your business rank higher in Google with the use of keywords in each blog post. Typically, we suggest that a company is producing one blog post a week with relevant keywords sprinkled throughout. A blog post with relevant keywords and is at least 800 words is the sweet spot. Luckily for you, content creation is BNL’s ride-or-die, so to speak. We love creating captivating content for your readers and clients with all the relevant keywords, file names and alt-text. Now that we’ve caught your attention and have you flirting with the idea of SEO, let us have the relationship talk. We only shared 4 ways we can utilize SEO, but we have even more tools in our SEO toolkit. SEO and social media are forever and BNL is committed in holy business matrimony with SEO. If you’re ready to start your next long-term relationship, contact us today. We can talk about SEO with hearts in our eyes for days and we know you’ll fall in love with the success that this tool will bring to you and your business. Let’s set up a date.